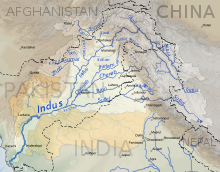 ^ The Indus Basin of Pakistan: The Impacts of Climate Risks on Water and Agriculture. World Bank publications. 1 May 2013. p. 59. ISBN 9780821398753. ^ Thieme, P. (1970), "Sanskrit sindu-/Sindhu- and Old Iranian hindu-/Hindu-", in Mary Boyce; Ilya Gershevitch (eds. ), W. B. Henning memorial volume, Lund Humphries, p. 450 : "As the great frontier river that represents the natural dividing line between India and Iran, the Indus could most easily and fittingly be called Sindhu- 'Frontier' by the Indians and Hindu- 'Frontier' by the Iranians." ^ "An A-Z of country name origins | OxfordWords blog". OxfordWords blog. 17 May 2016. Retrieved 23 June 2017. Holdich, Thomas Hungerford (1911). "Indus" . In Chisholm, Hugh (ed.). Encyclopædia Britannica. 14 (11th ed.). Cambridge University Press. pp. 507–508. ^ "WWF – Indus River Dolphin". Wwf.panda.org. Retrieved 22 September 2012. ^ "Tarabela Dam". www.structurae.the cat in the hat. Retrieved 9 July 2007. ^ "Indus Basin Project". Encyclopædia Britannica. Retrieved 9 July 2007. ^ Walsh, Declan (21 October 2010). "Pakistan floods: The Indus delta". The Guardian. ^ Walsh, Declan (5 October 2010). "Pakistan's floodwaters welcomed along Indus delta". The Guardian. ^ "Indus River Delta". World Wildlife Fund. Archived from the original on 23 January 2012. ^ "SEPA orders polluting factory to stop production". Dawn. 3 December 2008. Retrieved 28 June 2012. ^ "Fishing poison killing Indus dolphins, PA told". Dawn. 8 March 2012. Retrieved 27 April 2016. ^ "Threat to dolphin: Govt bans fishing between Guddu and Sukkur". The Express Tribune. 9 March 2012. Retrieved 28 June 2012. ^ "Almost all plastic in the ocean comes from just 10 rivers - 30.11.2017". DW.COM. Retrieved 22 August 2018. about 90 percent of all the plastic that reaches the world's oceans gets flushed through just 10 rivers: The Yangtze, the Indus, Yellow River, Hai River, the Nile, the Ganges, Pearl River, Amur River, the Niger, and the Mekong (in that order). ^ Schmidt, Christian; Krauth, Tobias; Wagner, Stephan (11 October 2017). "Export of Plastic Debris by Rivers into the Sea". Environmental Science & Technology. American Chemical Society (ACS). 51 (21): 12246–12253. doi:10.1021/acs.est.7b02368. ISSN 0013-936X. PMID 29019247. ^ "BBC News – Pakistan floods: World Bank to lend $900m for recovery". bbc.co.uk. 17 August 2010. Retrieved 24 August 2010. ^ "BBC News – Millions of Pakistan children at risk of flood diseases". bbc.co.uk. 16 August 2010. Retrieved 24 August 2010.